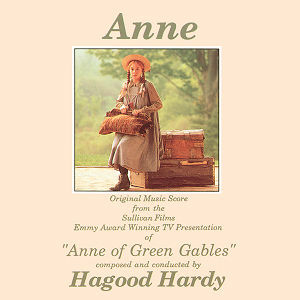 Música compuesta y dirigida por Hagood Hardy. Músicos solistas destacados: Nora Shulman (flauta), Vern Dorge (flauta), Melvin Berman (oboe), Richard Dorsey (oboe), Stanley McCartney (clarinete), Jack Zaza (clarinete), Jerry Toth (clarinete), Monica Gaylord (piano), Hagood Hardy (piano) y Erica Goodman (arpa). Grabada por Phil Sheridan, Mike Jones y Hayward Parrott. Mezclada por Mike Jones. Gracias a Francisco Silva por este CD. Serie dirigida por Kevin Sullivan. Interpretada por Megan Follows, Colleen Dewhurst, Richard Farnsworth, Patricia Hamilton, Marilyn Lightstone, Schuyler Grant, Jonathan Crombie, Charmion King, etc. Serie dirigida por Kevin Sullivan. Interpretada por Megan Follows, Colleen Dewhurst, Wendy Hiller, Frank Converse, Jonathan Crombie, Marilyn Lightstone, Schuyler Grant, Rosemary Dunsmore, Kate Lynch, etc.